The theme for this month's Pasta Please is homemade pesto, which is something I haven't made before. I don't often eat pesto as it seems quite oily but I thought freshly made would be more healthy and it was about time I had a go at making it! I did it for a mid-week dinner and it actually turned out to be very quick to make. Pesto is usually made of garlic, basil and pine nuts, combined with olive oil, but the name actually comes from the Italian verb meaning to pound or to crush. So technically anything made in this manner would be a pesto - I had some pistachios I wanted to use up from this cake so when I came across a recipe for pistachio pesto in Nigella's Nigellissima, it seemed ideal. Place pistachios, fresh basil, grated parmesan and salt in a food processor and blend to a paste. Simply stir into cooked pasta. This tasted delicious though it was more oil than I would usually use so I think this would have to be a recipe I make less frequently than others. I'll be interested to see the round-up for Pasta Please and if anyone has a healthier variant on pesto that doesn't use so much oil! 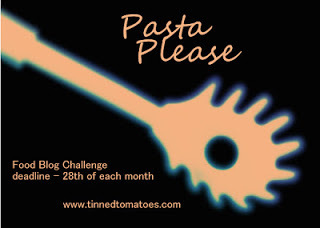 Pasta Please is hosted this month by Jen at Blue Kitchen Bakes and was started by Jacqueline at Tinned Tomatoes. Great way to use up some leftover nuts from baking! I'd agree with the comment above that if you're eating the pesto straight away then a little less oil probably wouldn't hurt.